Fattail or fat-tailed scorpions is the name given to the scorpions of the genus Androctonus composed by 18 species and considered some of the most dangerous in the world because of their lethal venom and aggressive temperament. Androctonus comes from the Greek “andras,” which means man and “kteinein,” which means “to kill”; This comes from their ability to kill a person by poisoning. Some of the best-known species of this genus are the Androctonus australis, the Black fat-tailed scorpion (Androctonus bicolor), the Arabian fat-tailed scorpion (Androctonus crassicauda) and the Androctonus maroccanus. Its most notable feature is the tail, as it is very different from other species of scorpions who possess it visibly narrower. The metasoma of the Androctonus is very thick and resistant from beginning to end, which contrasts with its thin pedipalps. This type of scorpion looks dark throughout the body, which may be reddish brown, dark brown or black. Some parts of their body look grainy and rough. Both the pedipalps and the tail of these scorpions and even the soles of their feet are covered with spines and sensory hairs very useful so they can recognize the terrain. Is considered some of the most dangerous in the world. They usually have a length between 3.1 and 3.9 inches, so they are not a species that go unnoticed. The poison of these arachnids is potentially lethal to humans, especially to those with health problems since its neurotoxic components act very fast in the body and attack the central nervous system, causing paralysis and respiratory failure. The Fat-tailed scorpions inhabit arid, semi-arid, desert, tropical, subtropical and temperate regions with sandy soils. During the hottest hours of the day, they stay in burrows, under stones or wood, crevices, construction debris or inside homes. They are animals that need temperatures between 85° F and 95° F so they can have a successful life cycle development. Its distribution covers the north and west of Africa, the Middle East and a small part of Asia. Countries with this type of scorpion are Morocco, Egypt, Israel, India, Turkey, Afghanistan, Pakistan, Yemen and the United Arab Emirates among others. They are nocturnal predators that are guided by their sensory hairs to find prey. Their common foods are some species of spiders, lizards, various types of insects, rodents and other scorpions. They crush their victims with the help of their pedipalps to prevent them from escaping and at the same time they inject their venom and releases their toxic poison that paralyzes the prey in a matter of seconds. They use their chelicerae to manipulate the victim so they can absorb the liquids created by the venom. The breeding process begins when the male leaves his burrow to go in search of a mature and available female. Once he achieves this first step, the courtship ritual begins when he takes his female partner from the pedipalps and starts to walk side to side and front to back, similar to dance. A female can have about 30 to 45 scorplings that will remain on top of her until they make their first molt. After that, they can get their food and defend themselves. A female can have about 30 to 45 scorplings. 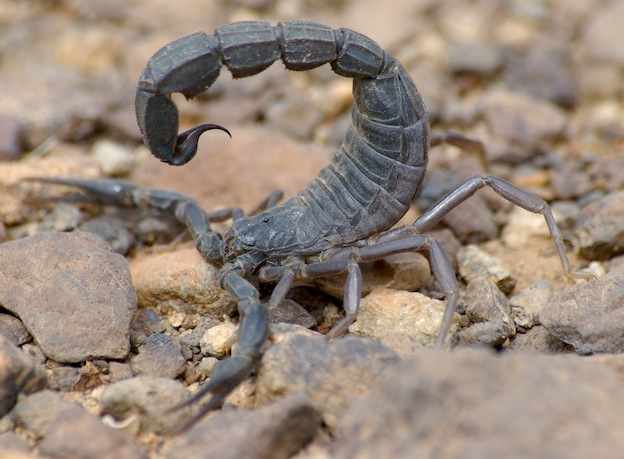 Despite their toxicity, the fat-tailed scorpions are common in exotic animal markets, along with tarantulas and snakes; this can lead to many risks. In certain parts of the world owning this animal is prohibited by law because of the high risk it represents. If the owner gets an accidental sting, besides from having to fight for his life, he will have to face the authorities. The best, without a doubt, is to let them live in their natural habitat.